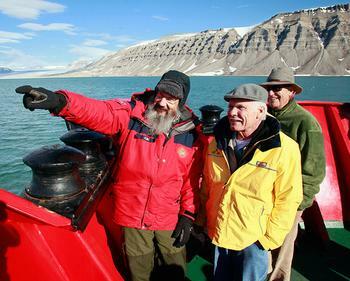 SVALBARD, Norway, June 23, 2011 (ENS) – Today, on a warm day very close to the Arctic Circle, board members of the UN Foundation, including Founder and Chairman Ted Turner, got a close look at what effects climate change is having on the Arctic. Based on observations to date, the scientists projected that this year the extent of Arctic sea ice will be smaller than it has ever been, even smaller than in the previous record low year of 2007. Among the board members visiting Svalbard was Gro Harlem Brundtland, a physician who served three terms as Prime Minister of Norway in the 1980s and ’90s, and then became director general of the World Health Organization. 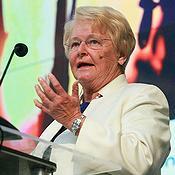 As chair of the World Commission on Environment and Development in the 1980s, Brundtland created the concept of sustainable development and provided the momentum for the UN’s 1992 Earth Summit. 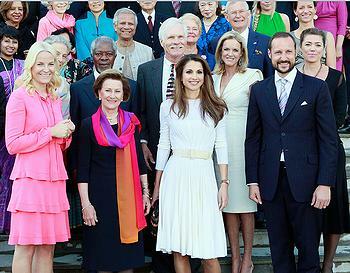 She now serves as a Special Envoy on Climate Change for UN Secretary-General Ban Ki-moon. Brundtland told reporters on the call that the scientists informed the group that ocean waters have heated up over the past decade at least one degree Celsius to a depth of 1,000 meters. “This is a dramatic change in a short period of time due to the changes humanity is causing by how we are acting,” Brundtland said. Asked what can be done to convince and persuade climate skeptics and deniers to recognize what so many scientists know and are trying to communicate so urgently, Turner said, “That’s a very good question. If we knew the answer to it, we’d already have an energy policy in this country,” he said, referring to his home country of the United States. Timothy Wirth, the former U.S. senator from Colorado who now serves as president of the UN Foundation, said the impacts of climate change being felt across the United States this year will convince many people. On Friday, the board members will join Cary Fowler, executive director of the Global Crop Diversity Trust, for a visit to the Svalbard Global Seed Vault. The UN Foundation helped establish the Global Crop Diversity Trust, an effort supported by the UN Food and Agricultural Organization, to establish a universal repository of the world’s crop seeds. The vault, which officially opened in February 2008, is designed to store duplicates of seeds from seed collections around the world. It was created to ensure access to crops should species be lost to climate change or new plant diseases, to help meet the needs of an expanding population, and to provide a back-up library of seeds should any of the world’s seed collections be depleted. The UN Foundation Board of Directors participated in New African Connections, a high-level conference in Oslo June 21-22 that explored creative solutions and partnerships in the areas of health care, finance and new technologies to advance development in Africa. 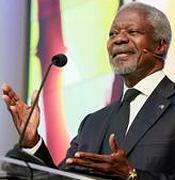 Brundtland and Turner and fellow board member Kofi Annan of Ghana, who served as UN secretary-general from 1997 through 2006, were featured speakers on a keynote panel focusing on public-private partnerships and innovation in health. The United Nations Foundation is committed to addressing the problem of climate change due to human activity by reducing its own carbon emissions and offsetting the emissions that cannot be eliminated. Every year the foundation calculates its cumulative carbon dioxide emissions at our Washington, DC, and New York City offices and purchases an equivalent amount of carbon offsets from a reforestation project in the Sierra Gorda Mountains of Mexico. The UN Foundation, a public charity, originated in 1998 when Turner, founder of the cable news network CNN, gave an historic $1 billion gift to support UN causes and activities and created the United Nations Foundation to administer the gift.